Sheldon Bosley are pleased to announce more training success for the residential lettings team. 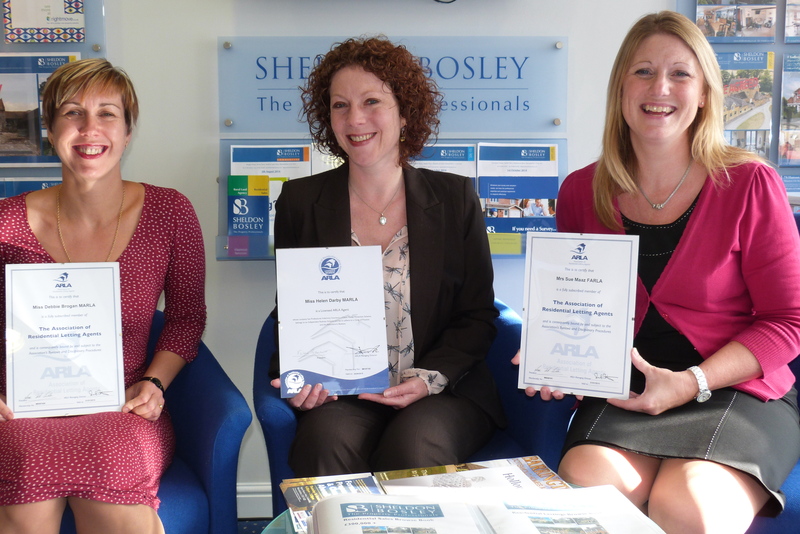 Helen Darby (pictured with colleagues Debbie Brogan & Sue Maaz) has achieved the technical award in ‘Residential Letting and Property Management’ and is now a member of the ‘Association of Residential Agents’ (ARLA). Sheldon Bosley believe that training is essential to ensure that a high quality service is maintained in all services provided. The technical qualifications that are achieved give confidence to our landlords, clients and tenants, that such a quality service will be delivered. Partner, James Walton, said “Sheldon Bosley are proud of their heritage as a firm of Chartered Surveyors and the professional approach to business is carried through every department. We welcome Helen’s achievement as a further step forward for the firm, and naturally add our congratulations”. If you would like to know more about our Lettings & Management service please visit http://www.sheldonbosley.co.uk.